For Serena Scanzillo, mental downtime is as important as physical movement. By Mary Clare Fischer·	 3/7/2019, 11:09 a.m. Welcome to Sweat Diaries, Be Well Philly’s look at the time, energy, and money people invest in pursuit of a healthy lifestyle in Philly. 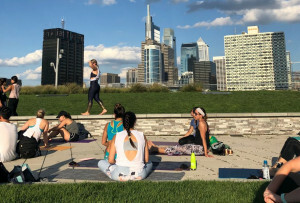 For each Sweat Diary, we ask one Philadelphian to spend a week tracking everything they eat, all the exercise they get, and the money they spend on both. Want to submit a Sweat Diary? Email mfischer@phillymag.com with details. What I do: I’m the founder of SerenaFit and run the SerenaFit Virtual Training Studio that features live workouts in a small group setting via video conference! My team of coaches and I lead workouts, ranging from yoga to HIIT to isolated strength to stretching, Monday through Friday. I’m also a certified fitness and nutrition coach and have been an entrepreneur in the start-up space for more than 10 years. You may have seen me at Athleta, too! I’m an ambassador there as well as at Sip-N-Glo Juicery. 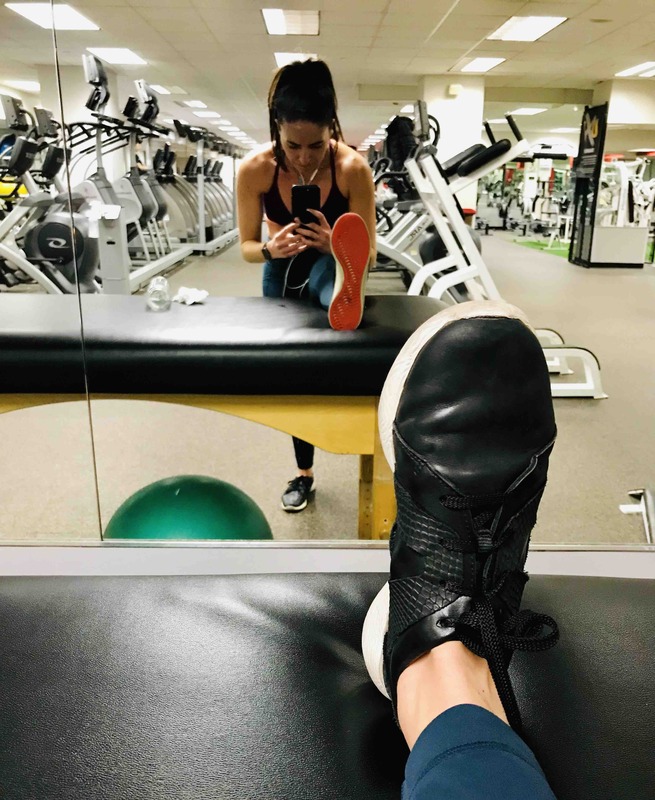 What role healthy living plays in my life: For me, healthy living isn’t just about how many workouts I can fit into my week or how many salads I eat. It’s more about the establishment of positivity within all aspects of my life. So that’s in my personal relationships, the decisions I make around food, how I treat my mind/body, how I treat others, the way I manage my money, and how I maintain my personal environment. I like to live intentionally, not on the fly. Each decision I make has some aspect of mindfulness attached to it. It’s about the whole picture! 5:10 a.m. — Wake up, wash up, and set intentions via positive affirmations while I brush my teeth. 5:25 a.m. — I drink my protein shake and cue up virtual studio workout sessions until 7:30 a.m.
8 a.m. — Second breakfast consisting of fiber fruits, gluten-free hot cereal with walnuts, and Bulletproof coffee. 8:15 a.m. — I check in on my SerenaFit Facebook page and personal training group, plan a few posts, and think a bit about what I want to showcase this week. I run a start-up group called the Solopreneur Network as well, so I post a video on the site and check in on a Forbes article on digital health before my 9 a.m. client. 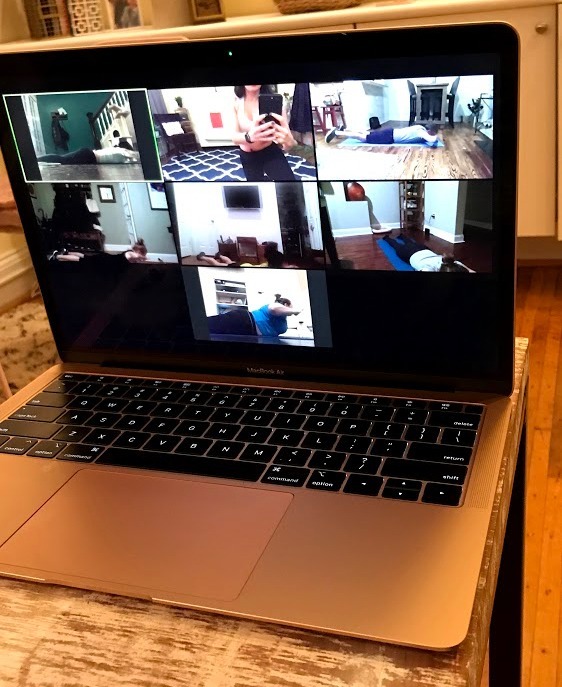 9 a.m. — Private online client checking in from D.C. We work through a 30-minute circuit consisting of stationary bike intervals, weighted boxing intervals, and core function. 11 a.m. to 2 p.m. — Daily time block. I have to segment my day or else nothing on the back end will get done! During this time block I work uninterrupted: no cell phone, no desktop pop-ups, no food, no email. Just one tab open on my browser, focused on one task. 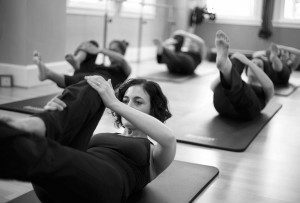 3 p.m. — At-home Pilates routine plus eight-minute abs and my eight-week challenge. 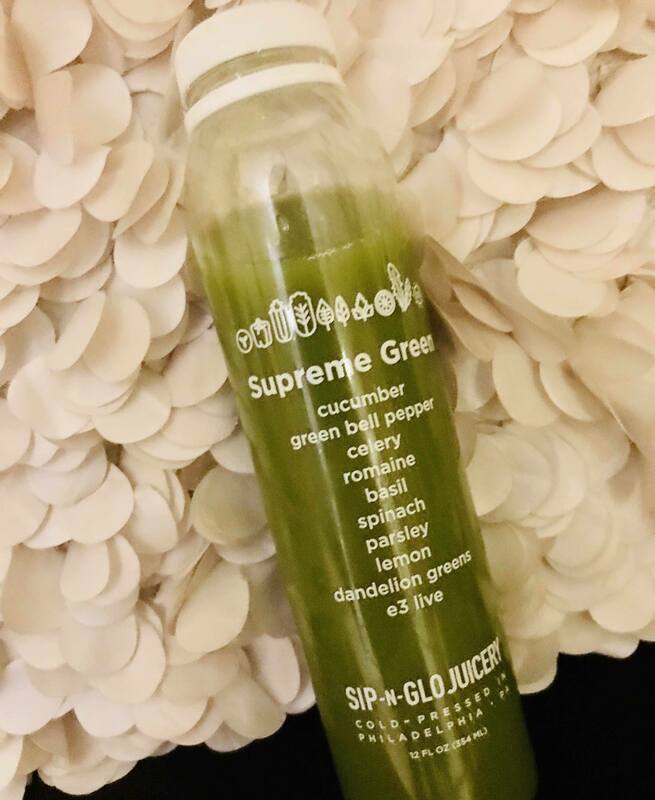 My boyfriend and I wanted to hold each other accountable in a fun way between now and Easter, so I came up with a daily challenge we each do on our own time: one super greens powder drink, one to five minutes of daily meditation, and 100 reps (20 push-ups, 20 sit-ups, 20 jumping jacks, 20 pike-ups, 30-second plank). 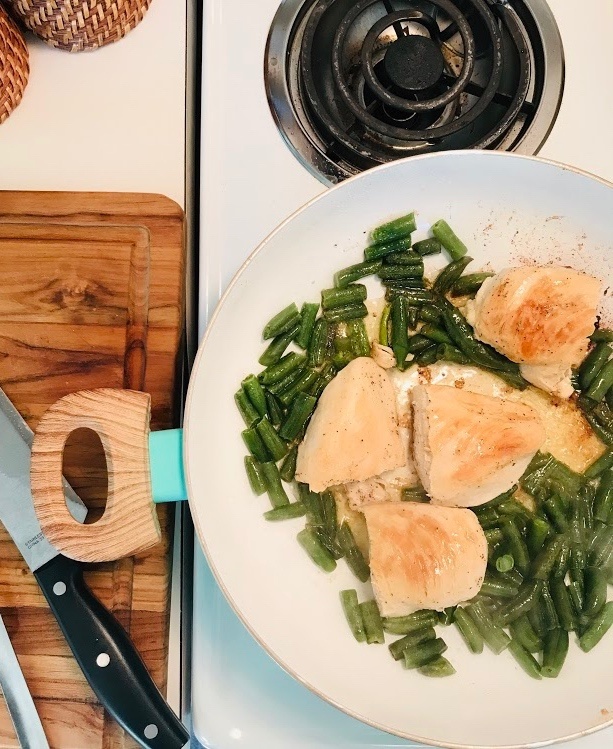 5:30pm — Whip up chicken with green beans and basmati rice. I’m working on eating more slowly and sitting down and being mindful during meals. As a trainer, I’ve been conditioned to eat on the go. I don’t really like that as I approach my mid-30s, so I try to plate the food, sit at my kitchen table, listen to music, and reflect on the day as I eat now. It’s been nice. 8 p.m. – Screens are off, and I chill in my bedroom. I’m reading a book on why things go viral, called Contagious. It’s really good. I chill in bed and read, journal a bit, and meditate for 15 minutes before lights out at 9:45 p.m.
5:10 a.m. — Wake up, wash up, and do my breathing exercises while getting tea and a protein shake ready. 5:30 a.m. to 8:30 a.m. — Train both folks in my virtual studio and one-on-one private clients online. We focus on core and upper body intervals! One of my clients slept through her alarm — it happens — so I use that 30 minutes to make a small breakfast, listen to morning jazz, and chill out before my next session. 9:30 a.m. — Make my way to an in-person client. I put myself on a cash diet for extra spending (coffee, lunches, kombucha, etc. ), which is $50 per week, so I make sure to bring my own water and make tea at the apartment before I leave. 11 a.m. – I have to grocery shop badly! I hit up Heirloom Market, the new Giant by Naval Square, and spend $61. It’s small, super easy to navigate, and has saved me a lot of money versus getting my groceries delivered. I love grocery shopping in person because it’s therapeutic for me. I take time to peruse the aisles, check out new products, and read nutrition labels. I do a lot of nutritional coaching ,so it’s important I have this type of information in my mental Rolodex. 12:30 p.m. — Intern interview. I’m working with the Temple football program’s business conference next month, so I have to catch up with my contact point. This person may also be a spring intern for SerenaFit, so we talk about that role and its requirements. Then I do a partnership call. Every Tuesday I coach an online class for government employees down in Fairfax Country, Virginia. I beam into four government buildings for employees to work out with me for 30 minutes every week. It’s been a fantastic partnership and experience so far! 5 p.m. — Hang out with my boyfriend. We play cards, have a glass of wine, eat dinner, and talk. Much needed down time/time to connect after a whirlwind 48 hours. 8 p.m. — I slide out to see a late client who’s seen wild success with me in the past year. We are both entrepreneurs, so while the session time may be late, I enjoy training him. We focus on a no-weight, functional HIIT program. 10 p.m. — Journal and bed. 5:40 a.m. — Rise and shine! Wake up, wash up, green drink, lemon water. 6 a.m. — Online sessions, both private and in the virtual studio. Today we focus a lot on lower body. 9 a.m. — Social media review, YouTube channel review, tea, ThinkThin bar, and some fresh fruit. I’m redesigning my YouTube channel and am filming a bunch of new content this spring. I’m really excited about it, so I’m doing some planning and research around what I want up there. Noon — Jonesing for a solid sweat session so I slide into a 45-minute cycling class at Philadelphia Sports Clubs. (I pay just $35 a month for a spring deal.) Add 20 minutes of interval cardio on my own. 2 p.m. — Chicken salad lunch and chill. 4 p.m. to 6 p.m. — Time block! I had to get to inbox zero in order for my mind to work properly. I cue up some classical music, fire off some important emails, and set up my schedule for tomorrow. I also make the much anticipated tax appointment and answer some texts about life! 7 p.m. — Protein shake, eight-minute abs, and meditation. 10 p.m. — Lights out. 6:10 a.m. — I have a short morning today. I coach an online class and a private session. We focus on low-impact mat work and core using resistance bands. 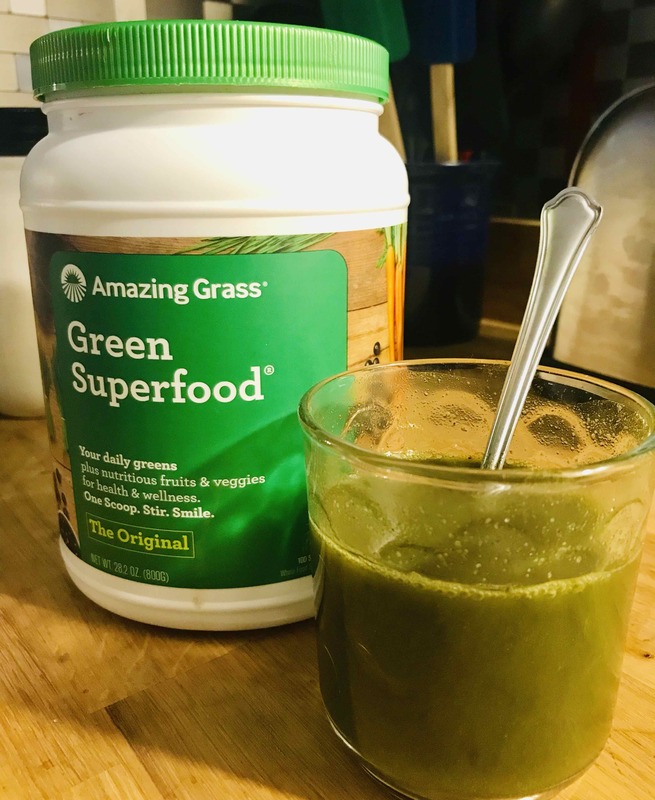 8 a.m. — Fruit, gluten-free hot cereal, tea, green powder drink. I listen to a few motivational YouTube videos and songs to prep my mind for the day. 9 a.m. — Stretching, mini strength routine in my living room, and thinking about what I really need to focus in on today. 10:30 a.m. to 2 p.m. — Time block! Today I have three big tasks to take care of. I have to create an informal job description for a spring intern, draft up an outreach letter, and review freelancer applications for the person we’re about to hire for editing/website work. Each one of those tasks should take anywhere from 30 to 60 minutes and require my undivided attention. Phone off, notifications paused. 4 p.m. — Time block ran over a bit. I have to go see my friends at the Moday Center for Functional and Integrative Medicine to grab some materials. They’re game changers to have as friends and as professional contacts. I refer a lot of people to them since they help change people’s lives through the power of food and quality supplements. 8 p.m. — Late night client. I grab a hot tea at Wawa (less than $4) on my walk over because it’s cold out! I add some lemon and skip the milk/sugar. 9:30 p.m. — Quick Friday schedule review. Tomorrow is dense. Meditate and lights out. 5:30 a.m. — Wake up and wash up. I’ve been using this egg white, hemp seed oil, and vitamin C moisturizer. It’s changed my skin’s DNA! I love products when they’re effective, and this has totally evened my skin out to make me feel great for the day ahead. 6 a.m. — This morning is a beast, so I have to pace myself. 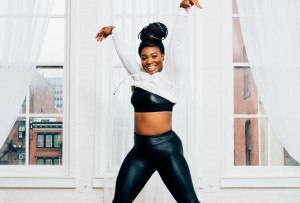 I’m teaching a 6 a.m. full-body class in the virtual studio. Then I’ve got three back-to-back private in-home coaching sessions at 7 a.m., 8 a.m., and 9 a.m. We take measurements, chat goals, and hit the deck hard to get in as much work as possible. 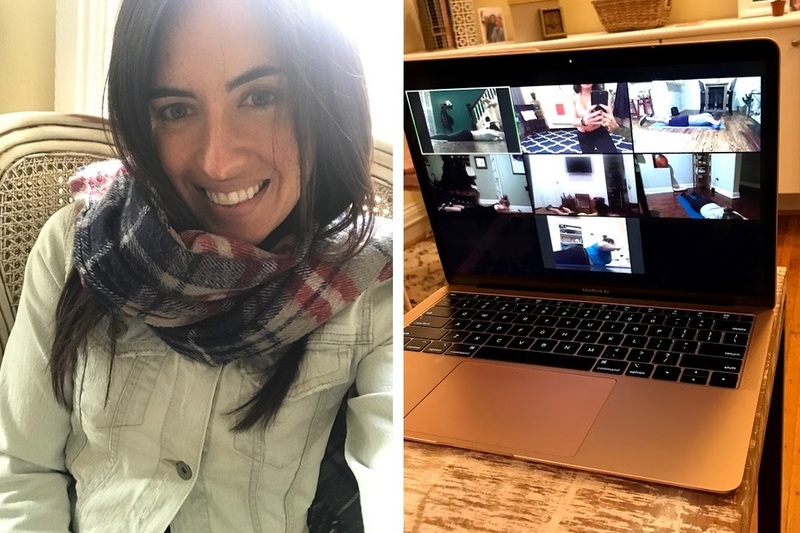 10 a.m. — Virtual mastermind call with my three cohorts down in D.C. and Virginia! I’ve been with these three ladies masterminding, collaborating, supporting, and growing since 2010, if not longer. As an entrepreneur, it’s essential to have these types of meetings on your monthly calendar. During this one-hour call, we talk outreach strategy, marketing, and retreat experiences, and set monthly goals. It helps to open up my creative mind! Noon — Lunch. I eat grilled chicken, spinach, sunflower seeds, mozzarella cheese, sea salt, and cucumber mixed with EVOO and fresh-squeezed lemon juice. This has been my go-to lunch this week! 2 p.m. — Mental downtime after the busy week. I leave myself a lot of time to reflect because the week can get away from me. I’m in a growth phase with my company and, if I don’t leave time to breathe, things can feel overwhelming. 4 p.m. — Reach out to my contact at the Leukemia & Lymphoma Society about tomorrow’s event. I’m the team captain for Athleta and am representing SerenaFit as well for the Big Climb event on April 13th; tomorrow is the kick-off run at the Linc. We’re running up and down every aisle in the lower half of the stadium. Yowza! I’m excited and plan my morning out a bit to be sure I eat enough, stretch, and arrive on time. 7 p.m. — Answer a few client texts, watch QVC (I know, but there’s something about that channel that brings me back to my childhood and relaxes me — my grandma used to have it on in the background growing up), talk with my boyfriend, and snack on chia seed pudding I made earlier. It’s a tame night, and I’m feeling grateful for wrapping up another solid week with a positive mindset. 10:30 p.m. — Pursue Pinterest (my not-so-secret-obsession), meditate, and lights out.